VoIP calling is pretty great if you know of the appendages it brings along. For many people, internet calling is only about Skype, where people can make calls to other Skype friends or add buy some credit to make calls to landline or cell phones. But that’s not only what VoIP is about. A VoIP phone can entirely replace your landline and even cell phone to some extent. If you are a VoIP phone user or looking for your first Internet Phone Service Provider, we are here to help. If you are not new to VoIP, you obviously may have heard of Vonage because it’s the leading VoIP phone service. But boy, do they charge exorbitant prices for being the no. 1 company? Yes, they do. However, we are not here to make the point that Vonage is too expensive; rather, at Fooyoh.com, all that we want is for you to find the best-value-for-money products. So the first time we landed on Axvoice’s website and scrolled a down a bit, we saw this big, fat tagline that boasted about its big features and a smaller price tag. Normally, we don’t like big claims but this one from Axvoice seemed promising because their focus was on providing a quality product at a good price—a perfect ingredient for a high value-for-money service/product. Without any further ado, let’s compare Axvoice features with its price. 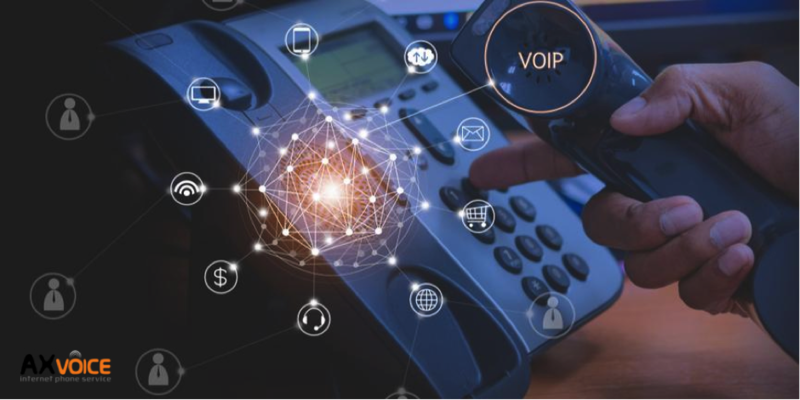 Because we are reviewing a VoIP phone service, we’ll breakdown the features into a few different categories: incoming, outgoing, call forwarding, and advanced. On Axvoice’s website, there’s a features page that covers all of this already, so we’ll just be giving you some pointers. Call Waiting: This allows you to switch between two different calls without hanging up on either of them. Distinctive Ring: This interesting incoming feature that allows you to set different ringtones for the virtual number that you may have for your Axvoice phone. Blacklist: Don’t like a particular caller, simply block them from calling you; an essential feature that you could ever have on your landline. Caller ID: The worst thing about landlines is that you never know who’s calling you without picking up a phone call. Caller ID is a present time’s quintessential element because it allows you to ignore or attend calls at your convenience and Axvoice sure does have it. Call Filter: You can redirect calls from your home phone to your VoIP phone with this Internet Phone Service Provider. Anonymous Call Rejection: No one likes spam calls, like no one and that's why Axvoice allows you to block unnecessary calls from strangers. Simultaneous Ring: This is a VoIP-exclusive so I would spend a little time explaining what it is. The Simultaneous Ring feature—though very much self-explanatory—allows you to let your incoming calls to ring up to 3 numbers at the same time. But why would someone want to have this? This is a corporate feature and prevents businesses from missing on customer calls. Do Not Disturb: You can redirect incoming calls to voicemail when you are not in the mood to pick them up, like when you are sleeping or when you are too pissed at your clients. Caller ID Blocking: If you are the kind of person who likes to see other callers’ caller ID but hides their own, then Axvoice is like the perfect Internet Phone Service Provider for you. This feature prevents your caller ID from showing up on others’ cell phones or even their VoIP phones. Three-way calling: You can add another person to an ongoing call without having to disconnect either of them. E911 Support: The Enhanced 911 support automatically sends your address to the 911 when you dial “911” using your Axvoice VoIP phone. This allows you to alert the authorities that you’re in danger without having to say a word. If you don’t have any international outgoing minutes left on your Axvoice subscription or if you want to just block international calls outside the U.S. and Canada, then Axvoice will definitely save you some bucks. Codecs: Having multiple codes, especially the G.729, GSM, G.711u, G.711a allows for great voice quality even at lower bandwidths. 7, 10 and 11-digit dialing: If you are making local calls, you don’t have to dial the country or area codes. We are not sure why this is even a feature because that’s how every landline also works. Correct us if we are wrong here. Alternate Caller ID: An alternate caller ID allows you to connect even with those callers who may not be interested in picking up your calls. Find Me Follow Me: Let’s say you are not at home and someone calls on your home VoIP phone. Rather than missing out on any potentially important calls, you can redirect them to specified numbers and that too in a pre-specified manner. Failover: If there’s an internet outage, like ever, you’ll still be able to take your VoIP calls on your cell phone or any other specified phone number. You can redirect your Axvoice calls to any landline numbers in the U.S. and Canada. Axvoice’s advanced features list isn’t as comprehensive as Vonage as we don’t see features like video calling or video conference calls. But they do have enhanced voicemail, BYOD support that allows you to use your current VoIP infrastructure for Axvoice, and softphone support (you can download an app and use Axvoice on the go from your smartphone). Axvoice comes in residential, business, and international residential plans. The residential plans start from $5.99/month while the unlimited residential plan is for $8.25. The business plans start from 14.99/month and the international residential plans start from $16.58/month. A lot of what you have read so far is fetched directly from their website. It all looks pretty great but how good is Axvoice in real, read on to find out. We may not have a hands-on Axvoice experience but we have done a job at finding what others have to say about this internet service provider. Our extensive research tells us that people are generally very happy using Axvoice because of its hundreds of impressive online reviews. And now let’s talk a little about the pricing. We think the prices are great. For instance, if you are a residential user of Axvoice, you could get unlimited Axvoice to landline and cell phone minutes to anywhere in the U.S. and Canada and only for $8.25/month. The average cost of a residential unlimited calling plan is around $25, so it’s almost three times cheaper than any other VoIP phone. Axvoice may not be a star VoIP service like Vonage but it’s perfect for residential and small business owners who don’t want to pay big phone bills and you can take our word for this. The international residential calling plans are even better and if you have a loved one outside the U.S. or Canada, you’ll really thank us for picking Axvoice.